One week before your scheduled pick up or delivery, a pharmacy technician will call you. We will have a monthly consultation where we see how you are feeling, review your prescriptions, vitamins and supplements as well as looking for ways to SAVE you money on your medications. Our technician will review your order before filling and call your physician if you need a refill. Your order will be ready for pick up or delivery on the day that you choose. How do I enroll in the Simplify My Meds Program? 1. Make an appointment with one of our pharmacists to enroll in the Simplify My Meds Program. 2. Bring all of your prescriptions as well as your vitamins or supplements to the appointment. 3. Together we will establish a date for your automatic Simplify My Meds order. 4. We will provide you and your physician a summary of your drug list. What if I am not a patient of this pharmacy? Not a problem! 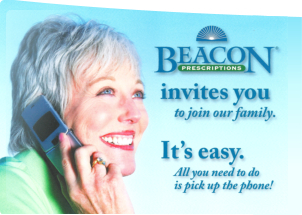 Simply call Beacon Prescriptions or bring in your prescriptions and we will take care of transferring everything to our Simplify My Meds program. Reduce stress, have more time to do what you enjoy! All with the Simplify My Meds program. Coordinate your refills with Simplify My Meds and make your life easier! Call us today to schedule a short appointment with our Simplify My Meds coordinator. We will explain the program to you and answer any questions you may have. You can enroll on the pot and start enjoying the freedom and convenience of our coordinated refill program.